The brainchild of a motorbike-obsessed leather dealer and a legendary eyewear designer, Chrome Hearts glasses epitomise luxurious style rebellion. Blending elegance, opulence and rock star detailing, every collection of Chrome Hearts eyewear features classic shapes entwined with intricate ‘biker-chic’ detailing, including gothic metal charms, dagger-inspired temples, iconic fleur-de-lys motifs and even hologrammed lenses. Each pair of Chrome Hearts glasses and Chrome Hearts sunglasses is crafted using only world-class materials, sculpted from Brazilian mahogany, the finest quality animal horn, white ebony, titanium, acetate, black leather and gold plate. 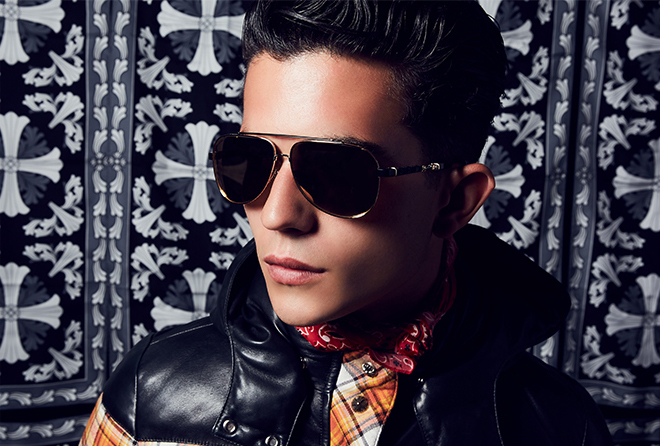 And with such lavish craftsmanship, it’s clear to see why Chrome Hearts eyewear has become the brand of choice for style icons including the Rolling Stones, Christina Aguilera, Marilyn Manson, Elton John, Angelina Jolie and Karl Lagerfield. Chrome Hearts eyewear with Hodd Barnes and Dickins.